INDIANAPOLIS, March 19, 2018 – Roger Sowinski, Asterion’s CTO and Vice President, will be presenting, “Chemical Oxygen Demand in Acid Zinc Electroplating Solutions: Impact on NSS Corrosion Results,” on Wednesday, June 6th, 9:00 a.m. 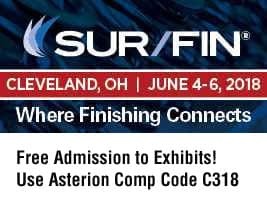 Co-authored by Alex Beck, Asterion Technical Services, the presentation will detail how COD analysis of acid chloride zinc electroplating solutions can be employed as a valuable tool in predicting NSS corrosion performance of trivalent passivates. Specifically, Asterion’s comprehensive study examines how COD levels of mixed chloride zinc electroplating solutions and their measurable content influence corrosion resistance and performance of a thin film trivalent passivate. The study offers three scenarios of COD contribution, including excess brightening and wetting agents as part of the normal proprietary bath chemistry; sulfonated water-soluble metal working fluids, and; normal oxidative breakdown of proprietary electrolyte additives.